Lake Tibet is a 1190-acre oligotrophic lake, located in southwest Orange County, which is part of the Butler Chain-of-Lakes. A study on the Chain-of-Lakes conducted by ERD during 2007 documented elevated phosphorus concentrations and mass loadings discharging from Sub-basins 1 & 2 into Lake Tibet. 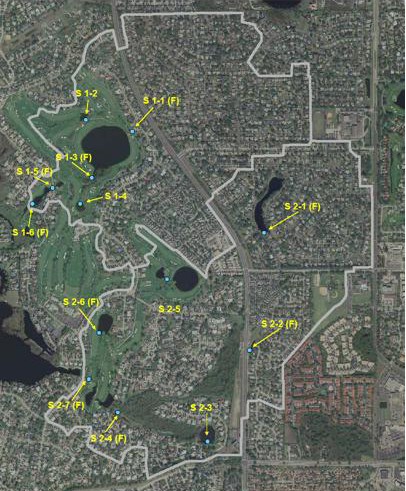 Sub-basins 1 & 2 contain 446 acres of residential and golf course land use with no significant stormwater treatment within the basins. Runoff migrates through a series of interconnected golf course ponds prior to discharge to Lake Tibet. The golf course areas have received treated wastewater reuse for irrigation since the 1990s. Orange County contracted with ERD during 2007 to identify the source of the elevated phosphorus concentrations and develop conceptual management recommendations to reduce phosphorus concentrations and loadings discharging to Lake Tibet. Field monitoring was conducted in Sub-basins 1 & 2 from October 2008-March 2009 to characterize the quantity and quality of discharges within the basins. Surface water monitoring was conducted on a bi-weekly basis over a period of 6 months at 10 monitoring sites along the main flow paths through the two basins. Six shallow groundwater monitoring wells were installed within the basins and monitored on a monthly basis to assist in identifying potential nutrient sources. The collected surface water and ground water samples were analyzed in the ERD laboratory for general parameters and nutrients. Stable isotope analyses of 15N and 18O were also conducted to assist in identifying sources of phosphorus such as runoff, fertilizer, or reuse. A detailed field reconnaissance was conducted for the two sub-basins to identify conveyance mechanisms, structures, and overall drainage patterns. Substantial increases in loadings of nitrogen and phosphorus were measured during migration through the golf course area. Nutrient enrichment was observed in both surface water and ground water with Sub-basins 1 & 2. The isotope analyses indicated that both reuse water and fertilizers are likely sources of nutrient loadings. The results of the field monitoring efforts were used to develop hydrologic and nutrient budgets for the two sub-basins. A management plan was developed to reduce phosphorus loadings within the basins which included recommendations on fertilizer use, management of reuse applications and stormwater treatment.